Players may enter by mail or via the Mass Lottery's website. To enter by mail, send one (1) non-winning 2014 New England Patriots ticket in an envelope no larger than 4-1/2 x 9-1/2 inches. Legibly print your name, address, telephone number and email address on the back of the ticket. One (1) entry per envelope. Each envelope must contain the appropriate postage. Entries submitted via the internet must be submitted from a computer located in Massachusetts. 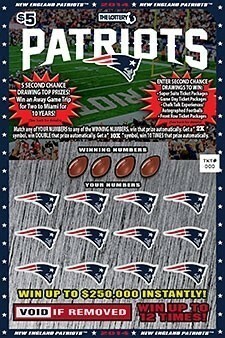 Follow the links on www.masslottery.com or go to www.patriotsmasslottery.com, establish an internet entry account and enter one (1) non-winning 2014 New England Patriots ticket per the entry instructions. For questions about the Second Chance Drawing, call (800) 511-6309. Only entries received at the 2014 New England Patriots Second Chance Drawing address and via website listed above are eligible. Tickets submitted by mail are not eligible to be submitted via the internet and tickets submitted via the internet are not eligible to be submitted by mail. Tickets entered both by mail and via the internet will be disqualified. Each qualified entry is guaranteed to be in one of five (5) Second Chance Drawings. Players may enter as many times as they wish. Entries are valid for only one (1) Second Chance Drawing. All entries must be received no later than 60 days after the official end of game as announced by the Lottery. Second Chance Drawing prizes are not redeemable for cash. Second Chance Drawing winners' names and hometowns may be posted on the Lottery's website following validation of winners after each drawing. All Second Chance Drawing winners must complete a Lottery claim form and provide proof of positive identification and Social Security number. All game tickets, seats and autographed footballs will be randomly assigned by the New England Patriots and all assignments are final and non-transferable. The Second Chance Drawing is subject to the rules and regulations of the Mass Lottery and its administrative bulletin.